We have had some great photos submitted so far! Make sure to check the facebook page to see all of them. We will decide by the time the Stanley Cup is raised, who won 2 tickets to the home opener. Get your photos in. Here are a few of my favourite so far: Also a shout out to Doug for taking pictures in front of all MLSE properties with his OTL logo poster. BIG NEWS ANNOUNCEMENT!!! Clear your calendar for next Wednesday night, April 12!! Maybe get on TV! We are going to create a playoff atmosphere in Toronto at a local sports bar next Wednesday night. Time and location will be announced on Sunday night by email blast, twitter and facebook. Maple Leafs Fun Fact: After Smythe was unfairly fired from the Rangers, he vowed to win a cup in revenge. He bet $10,000 on a football game and won. With the winnings he bet on a Hockey game and won again. He and some others, paid $164000 for the Toronto St. Patricks and renamed them the Toronto Maple leafs. In 1931 Maple Leaf Gardens was built in just 5 months, 100 yards from where Smythe grew up. For our TorontoFC fans, Marlies and Raptors Fans, we have not forgotten and as our army of volunteers grows we will get the sites set. My sincere apologies but we have been working to stay on top of everything to make the dream a reality. For those of you going to the last game before we own the team on Saturday, please make sure you print off a poster and show it everytime a camera is on you or the leafs score a goal. 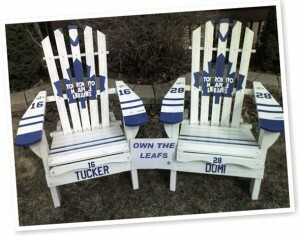 Facebook.com/owntheleafs As I write this email, we are now at 2109 likes. Post on the facebook wall when you think we will hit 5,000 likes and 1,000,000 likes and the person with the closest answer for time and date wins an Alberta Steak dinner for two courtesy of Own the Leafs. Follow along on twitter @owntheleafs we have over 275 followers now. Going to http://ownthemapleleafs.com/?page_id=17 and print off for your car/business/office or take to the game. We are going to give away a pair of tickets to the opening game next year for the best photo of Own The Leafs Logo in your community or at a game.